Some concert venues get props for their great views. The Volcano Room has some, but they're not what you expect. They're 333 feet underground. The Volcano Room is a ballroom inside Cumberland Caverns in McMinnville, about an hour-and-half drive from Nashville. Inside the natural cave are all sorts of man-made amenities, including restrooms, running water, tables, chairs, concessions and an enormous chandelier that came from the Lowes Metropolitan Theater in Brooklyn, New York. But the natural amenity that brings many Nashvillians to the cave are the great acoustics, making the Volcano Room the perfect place for a concert. Bluegrass Underground is a series of concerts in this space. It began in 2008, and now regularly sells out, as music lovers can't resist the lure of the dramatic cave, the great sound and the novelty of a subterranean music venue. Many concerts take place during the day (though you won't know it once you are underground) and are no smoking and alcohol-free, so you won't come smelling the beer the guy next to you spilled on you. Unless otherwise indicated, all shows are all ages. Becky Buller Band with Off the Wagon (April 16, 2016, 1 p.m.); Hayseed Dize with Aaron Lee Tasjan (April 30, 2016, 1 p.m.); Helen Highwater Strong Band and the Ransom Notes (May 21, 2016, 1 p.m.);and Edward Sharpe and the Magnetic Zeroes (May 30, 2016, 8 p.m.). More shows will be announced and added throughout the year, often with many GRAMMY-award winners on the docket. The annual Christmas show is a big draw. Ticket prices vary by show and there are also weekend and VIP passes available for those who want to catch multiple tapings of shows and want to package a cave tour with their weekend festivities. Yes, that's right. 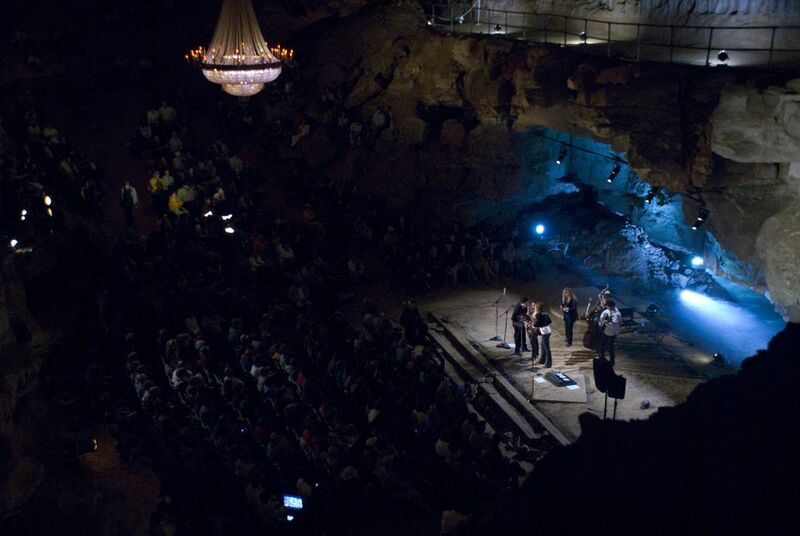 The caves are open for tours, even during the shows (the tours go along the balcony, not through the concert space). Tours ranging from those that require moderate exertion to those that require you to climb on your hands and knees and even some overnight cave tours for those brave enough to sleep underground (nighttime tours are open to those ages 16 and older only). On the tours you'll see cave forma­tions, underground waterfalls and pools, and a historic 1812 saltpeter mine. Tours prices vary, but start around $19.50, children $12.50 for the day­time walking tour.\. The under­ground tour is 1.5 miles long and includes the sound and light show God of the Mountain. Kids will also enjoy the Cumberland Caverns gem mine, where they can search for semipre­cious stones. VIP packages also include lodging at nearby cabins and meet-and-greets with the performers. Please note that the space is not wheel­chair accessible, for tours or the concerts.